Paul Biya, Cameroon’s strong man some 11 years ago heaped a lot of praises to the sacked General Manager of the Cameroon Shipyard and Industrial Engineering LTD known as Chantier Naval for the speedy growth and progress of the company within a short while. This goes without saying that Mr. Paul Biya knew the capabilities and statesmanship found in Mr.Zachaus Forjindam. This is why he single-handedly picked him and praised during his end of year speech to the nation. Nevertheless because of the in-fighting that has been ravaging the company, the post of deputy General manager in charge of financial affairs was created, a post that never existed even in other state own corporations. This gentleman was accused of emblazing FCFA 970 million together with the human resource manager madam Rose Njoh. This has been attributed by some local tabloid as the Beti mafia. Be it as it may, BaretaNews main worries lies to the fact that, it is alleged that the deep sea port project meant for limbe which Forjindam was spearheading was manipulated and taken to kribi after feasibilities studies proved that Limbe is the best area for such a project. This is what Forjindam has been fighting to bring to Limbe. It is well established that Limbe has naturally sea port other than what exist elsewhere in the country whereby on a monthly basis the sea is being dug for sand removal in order to make it possible for the ship to offload onshore. This again is another aspect of total assimilation and neglect of the English region by the francophone powerful autocrats. The south West chief conference and the elites have remain powerless in the face of this? Nothing meaningful has come from these gentlemen of the south-west chief conference. Also, the-the sons and daughters of Anglophone region who claimed to be prominent members of Government cannot help either? Can’t they also fight and ensure that God’s reality be done? How can the Government prefer to be losing billions of CFA just to ensure that sand is dug out of the seaport in Douala and Kribi when we have a natural one here in Limbe that could help save the money and used it for other developmental projects? The manipulating the deep sea port project to Kribi has gone a long way making it clear to the younger generations of Anglophone to agree with ‘secessionist’ movements. Insight sources established that despite what was presented, it was alleged that Mr.Forjindam sacked came as a result of his fight to see the creation of the limbe shipyard project instead of Kribi. He also wanted to ensure that the deep sea port project stays in limbe but the Beti mafia could not allow him breath. Though we cannot condone with any aspects of corruption, we have seen Ministers and state-owned General Managers in power for two-three years embezzling billions upon billions but Forjindam who has been the longest state-owned manager for over twenty years is being accused of embezzling just FCFA 970 million not alone but with his human resource manager Madam Rose Njoh meaning both of them share the cost of the money embezzled. It beats us to wonder how someone in 20 years could embezzle just 970 million if not of the political bad faith smokescreen as embezzlement charges. It is true that the Betis dominate and virtually sit and occupy almost all financially viable sectors of the Country’s Economy and since Chantier Naval had reached it the apex of oozing out money, it was then time for one of theirs to sit on the Goldmine. The previous General Manager of Chantier Naval who replaced Forjindam was Atoine Alo’o Bikoro. He was hitherto deputy general manager in charge of financial affairs, a post that was created and never existed in state corporations. This was set in motion to complete the bad faith and evil intentions of the Beti click. Recalling that, it was the same Bikoro who lead the audit team which finally saw Forjindam packing out of the corporation, though Forjindam wrote to the presidency and protested the irregularities found in the audit report, nothing has filtered out of the presidency up till now. How can you ask a rival to audit the GM? Obviously, there is bound to be biased just to give a dog a bad name to hang it. What has become of Chantier Naval today? It has speadily diminish and do not bring in returns as to when Forjindam was head. 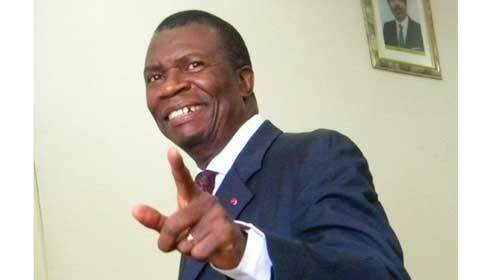 We of BaretaNews understands that he was the first to call for last revision of Cameroon’s constitution to give Biya an unlimited presidency. However, this does not negate the issues of political bad faith to nail the man. Biya always eats his own. We of this platform thinks President Biya should come out tall and ask for the audit report which he ordered be published so that the truth can be known rather than relying on the ill-fated audit report done by the Board of Directors lead by the Beti click. It is the responsibility of the Head of State to ensure that the state own audit report which cleared Forjindam is used rather than an ill-fated audit report.